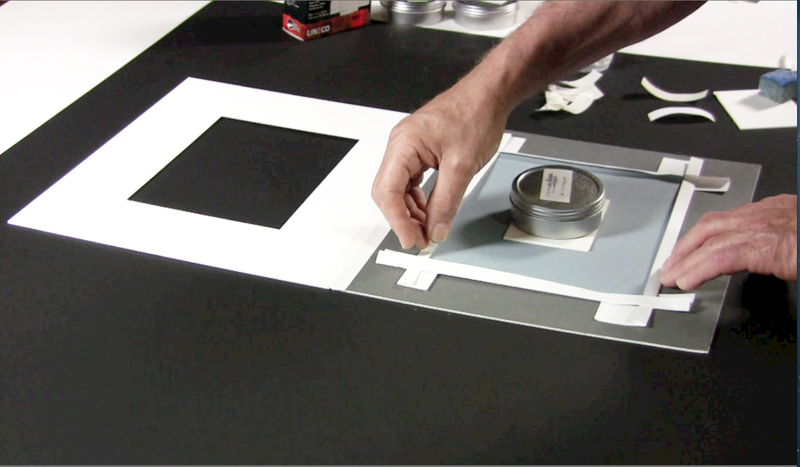 Making edge strips is another method used by museum preparators to mount photographs and art on paper to backing boards. 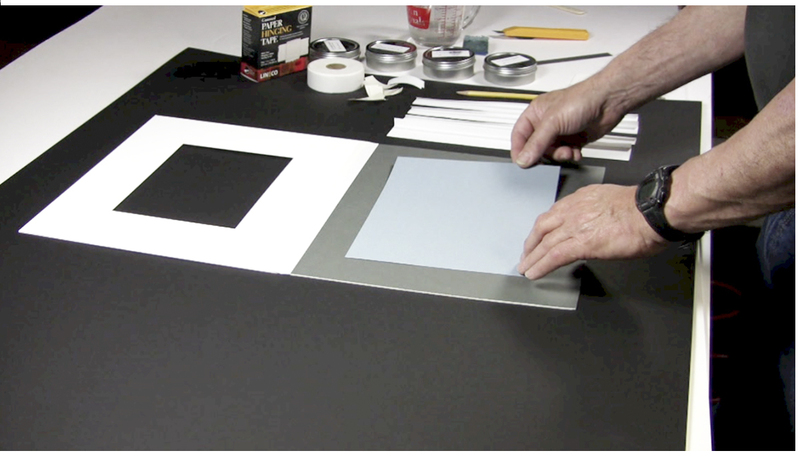 The edge strips are made from archival paper and no adhesive touches the art ensuring the long term safety of the art. Assemble your tools and supplies. 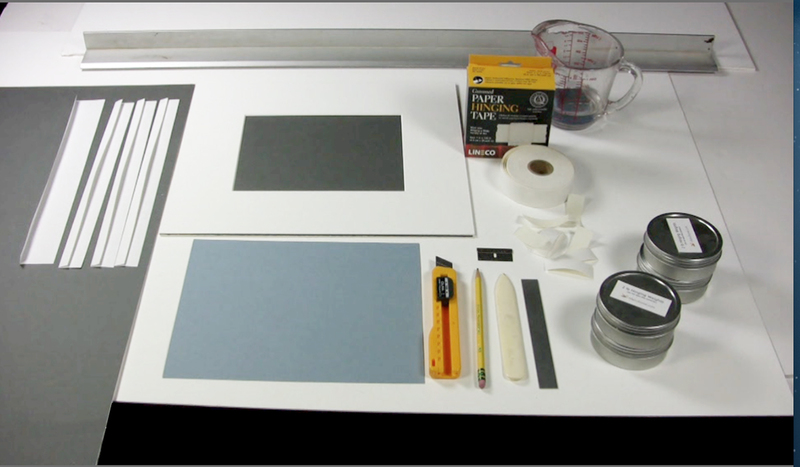 They are: paper edge strips, mat that has been attached to a backing board, straight edge, mat knife or razor blade, pencil, burnishing bone, ruler, weights, archival paper tape, water, and a sponge. 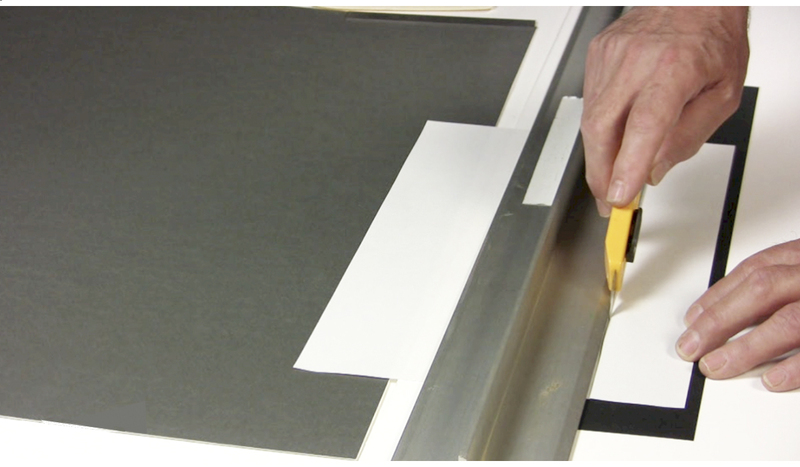 Determine the size of conservation paper you need to make edge strips for your artwork. 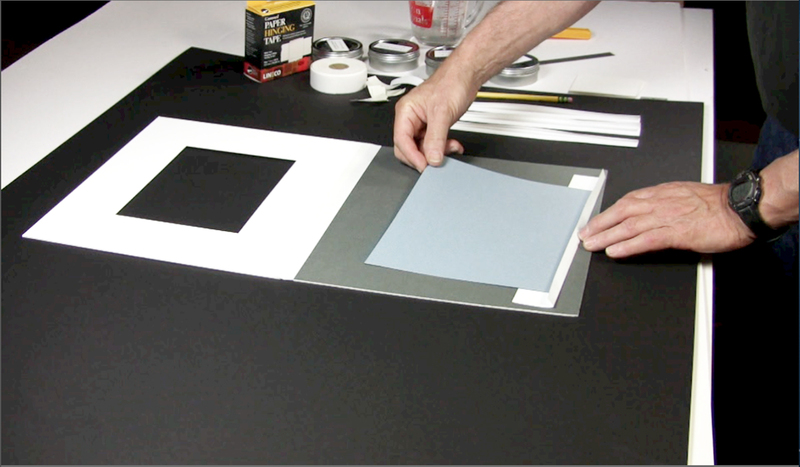 The strips should be 1 1/2 – 2″ longer than your artwork on both sides. 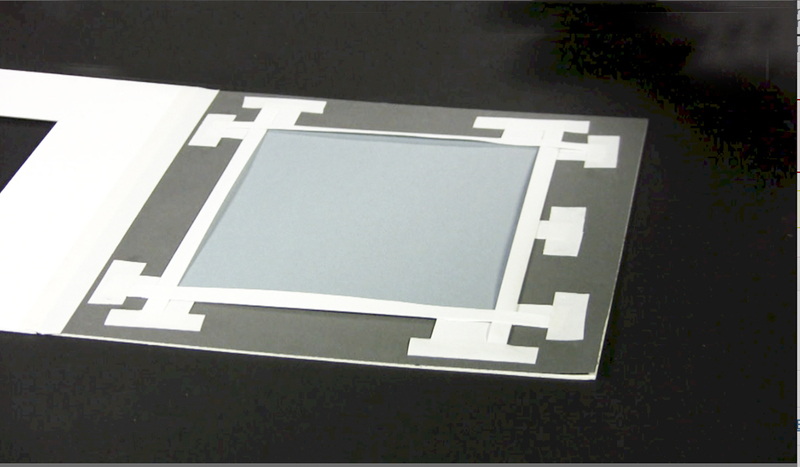 To cut the strips you will need a straight edge, ruler, and mat knife or razor blade. Note: The paper we used was permalife which is a 20 lb. white paper which is 25% rag and 75% pure cellulose. It is acid and lignin free and buffered. It has a pH of 8.5. It is available from many online sources. 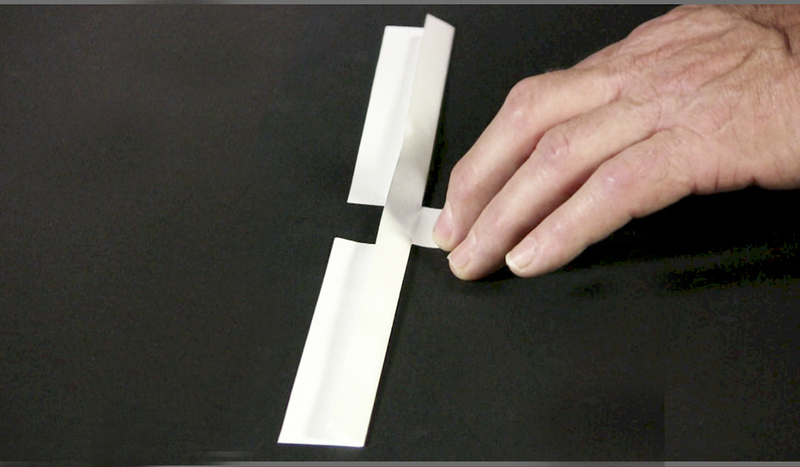 Cut the strips of paper the width you want. The bottom strip should be wider in the back than the other edge strips because it carries the weight of the artwork. On this project we cut the bottom strip 2″ and the top and side strips 1 1/2″. Make a fold in the strips. The technique we use is to take a burnishing bone and run it along the straight edge. 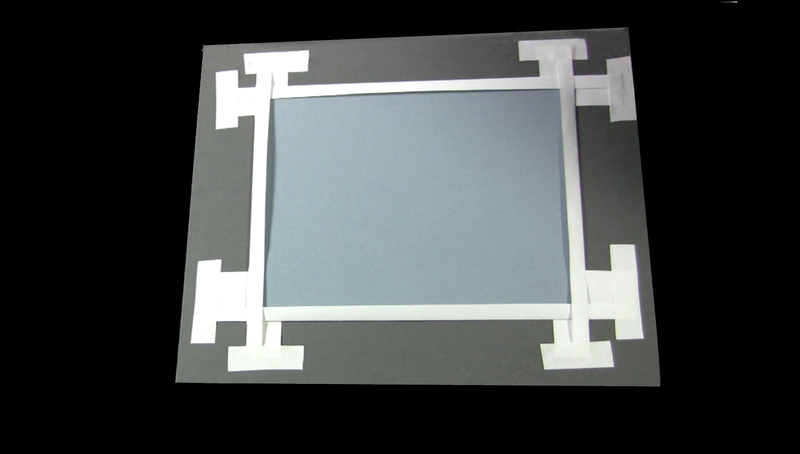 On this project we made the fold width 1/2″. It can be made larger on heavier artwork with wide borders or smaller on light weight artwork with narrow borders. 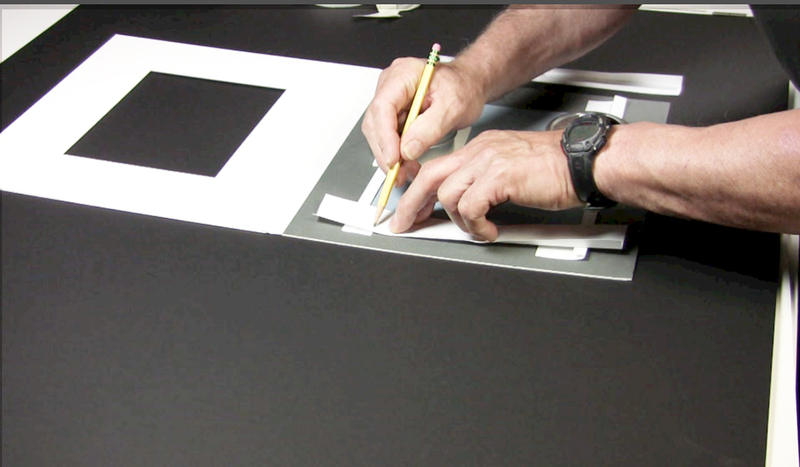 Use your hands to make sure the crease lies flat against the back of the paper. 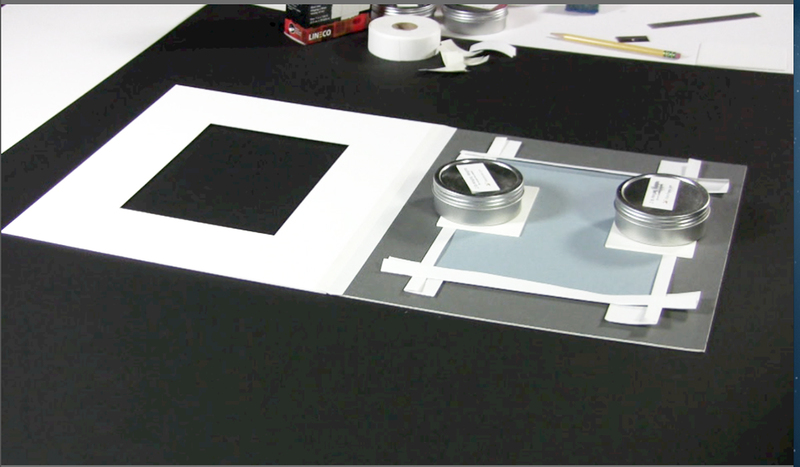 Now take your artwork and place it on the backing board that has been attached to the mat. 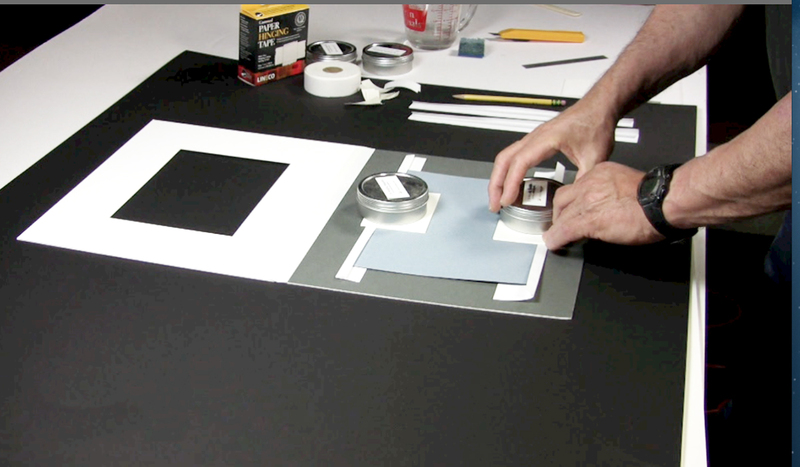 Take the bottom edge strip and place it on the artwork. Centering it so there is equal space on each side of the artwork. Next take the top edge strip and place it on the artwork centering it as you did the bottom strip. 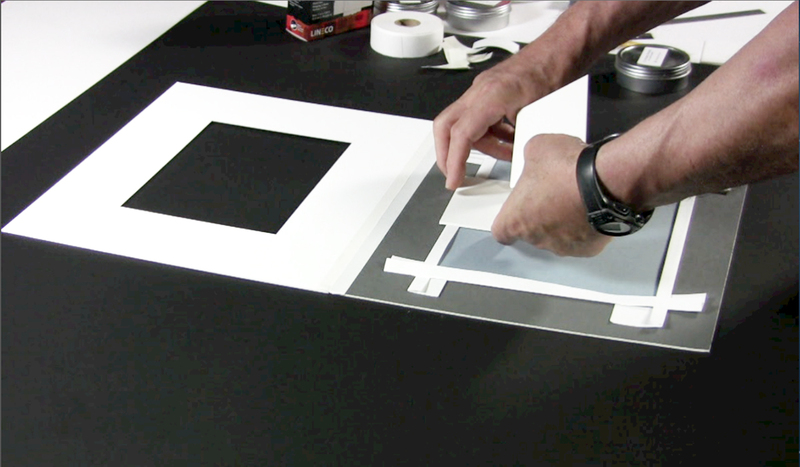 Now put a barrier paper on the artwork and weight the top and bottom strips down. Place the side strips along the side of the art. Then take a pencil and mark where they intersect with the top and bottom strips. 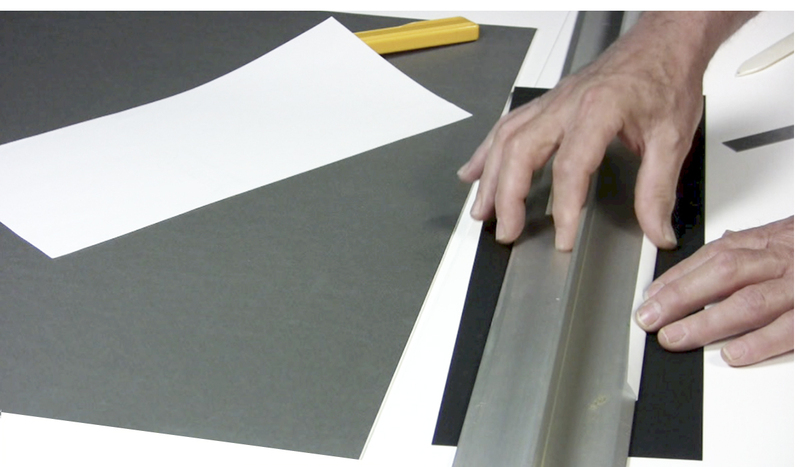 Take a razor blade or mat knife and make a cut in the fold where you have made the marks with your pencil. 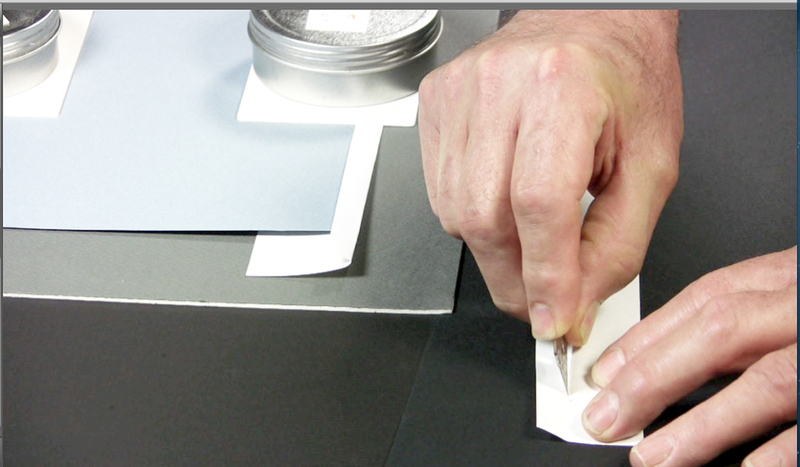 Now take the side edge strip and place the top edge strip through the cut you made in the fold. Repeat the process placing the bottom edge strip through the slit on the bottom of the side edge strip. 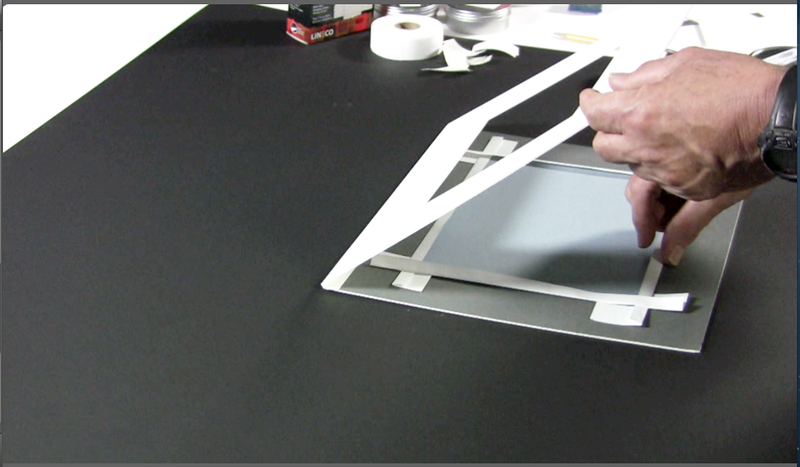 Once top and bottom edge strips are inserted in the slots on the side edge strip slide it over until it is covering the side of the artwork. Repeat the process on the other side. This is what it will look like after all 4 strips are on the artwork. 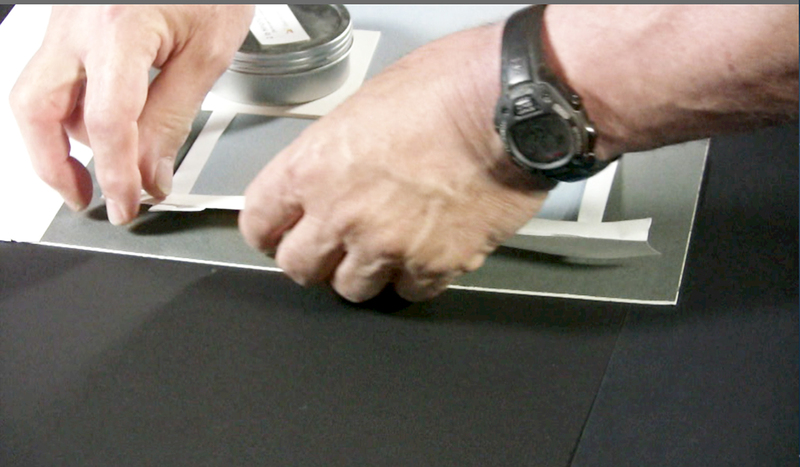 Remove the barrier paper and weights from the artwork. Center the artwork underneath the mat. 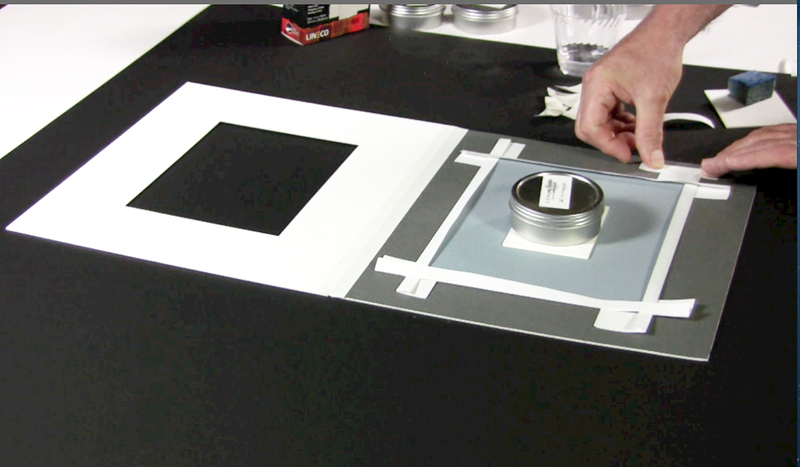 Once the artwork is centered, place a barrier paper on the artwork and weight it down. 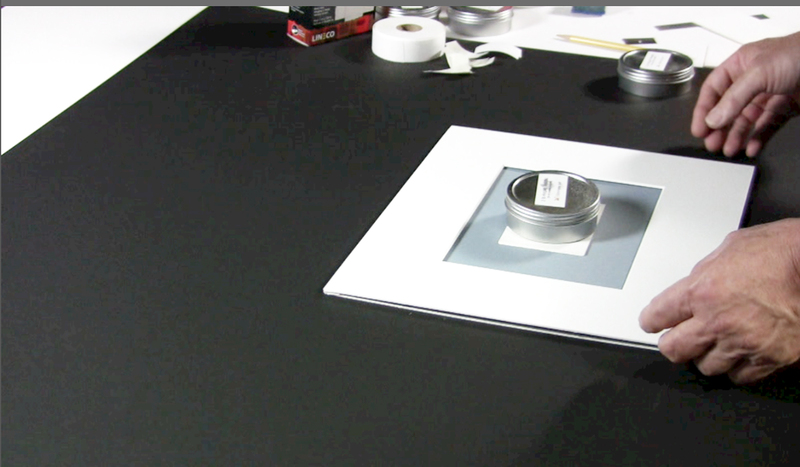 Raise the mat up and make sure all of the edge strips are covering the edges of the artwork. 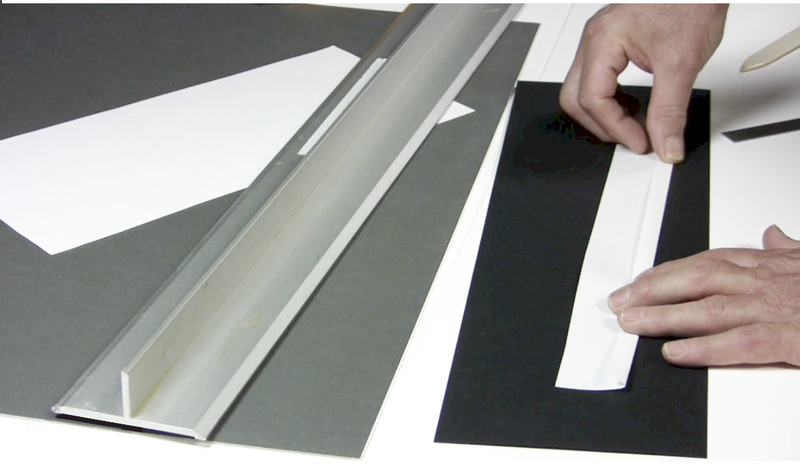 Take archival paper tape and tape down the ends of all four edge strips to the backing board. This is a technique that can be used for heavier pieces that need more support. Cut out a section and or sections in the edge strips. 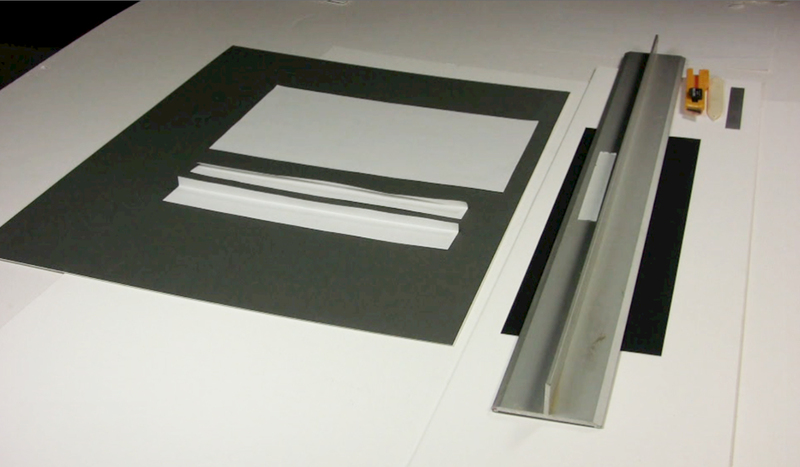 Then use the archival tape to adhere it down to the backing board.